The 64 Colors character “Marshall Mashumaro” has been out for awhile. The story behind this toy is that he’s a boy that ate so many marshmallows that he actually turned into one, hence for the marshmallow head. He’s been on apparel and accessories as well as been the center of custom toys. There’s even a blind box series of Marshall vinyls. But our favorite is Toasted Marshall, a roasted version of the toy. 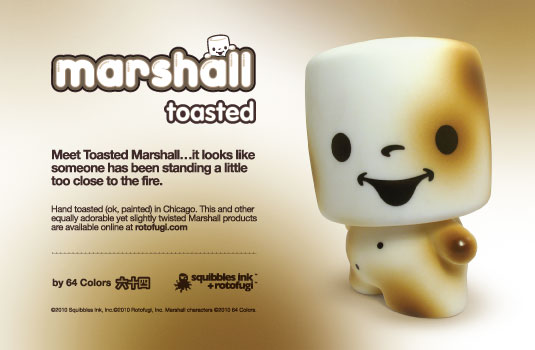 Toasted Marshall is the result of a collaboration with designer toy store/gallery Rotofugi and Squibbles Ink. He’s a little over 3 inches tall and is a blind box toy despite the fact he comes in clear plastic packaging (he’s considered a blind box since each one is painted differently-you can’t decide how you want your Marshall painted). Toasted Marshall is sold sporadically through Rotofugi and goes for $15 USD. Be sure to check out Rotofugi from time to time to see if he’s in stock!